I can’t believe my little girl is two months already! Allie is such a sweet baby and is pretty happy- unless she’s hungry. She absolutely LOVES her big sister and is smiling and cooing at us. She has got some strong legs and likes to push off of anything she plants her feet on. She’s starting to give me longer of stretches of sleep some nights and that is a huge help. She is growing so much faster than Pyper did and I don’t know how to handle it! She was born weighing 5 pounds 14 oz and was 18 in long. At her two month appointment she weighed a whopping 10 lbs 3 oz and is 21.75 in long!! What??? Paper didn’t weigh 10 pounds until she was almost 5 months old! I didn’t make a blog post for her one month photos- but here are a couple so that you can see the changes she’s made! Here are her two month photos. I’ve decided to keep her photos much more simple than I did with Pyper. With Pyper I had different themes and looks every month and while that was super fun, it’s just not what I’m into anymore. I love capturing Allie just in our home, playing like she does every day. I think the memories are more natural and it’s a great opportunity to capture our home here in Santa Barbara as well. There are certainly benefits to doing super cute themes every month and those memories are just as exciting- but taking more lifestyle photos is just a different feel. 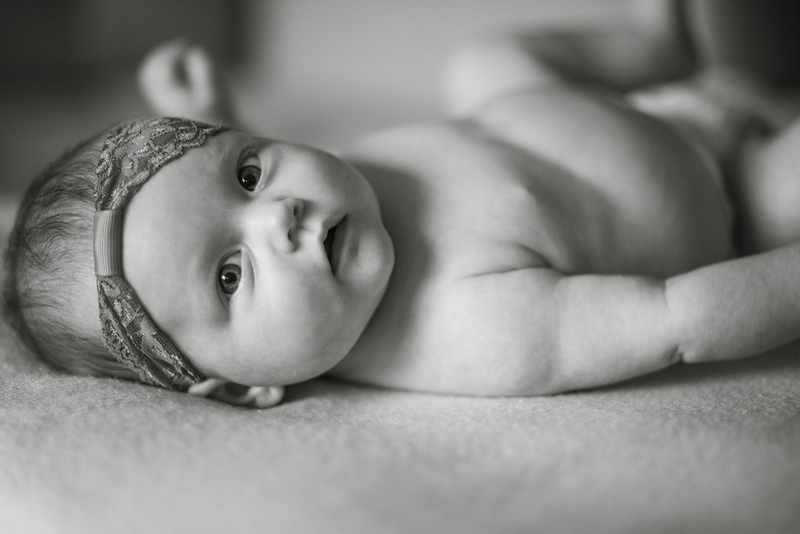 I love these photos of Allie and watching her grow and explore this crazy world. She was just playing on our couch and the lighting was beautiful so I grabbed my camera. Just real, in the moment photos.